I have a lovely old quilting book called ‘Patchwork; 25 classic step-by-step projects’ by Diana Lodge. The quilt on the cover is the inspiration for the design, although curiously it is not one of the projects in the book. Even more curiously the hexagon template is actually an octagon! They will all have another row of 1 1/2″ hexies and sashing to join them together. I took the photos on my phone under electric light so the colours are not really true. It is a scrap quilt and some of the fabrics used are the end of that particular one in my stash. How lovely are these hexies. Love all the pretty fabrics you have selected. A most wonderful slow hand stitching project. There is nothing quite like stitching an EPP hexie pretty. 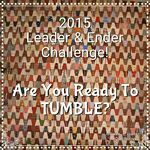 A wonderful project… I enjoyed looking at all the fabrics you are using!